I really love almost any tofu recipe, because not only is tofu is really good for you, it is a really versatile ingredient, and is also suitable for vegetarians, vegans, those on low-carb or gluten-free diets. Tofu is also very nutritious, containing all 8 essential amino acids, and is a great source of iron, calcium, vitamin B1 and other minerals including magnesium, copper and zinc. In Asia, we have been eating tofu (or bean curd) in all shapes, sizes and forms for years. In the West, tofu or soy have started to gain recent popularity, especially for vegetarian and vegan diets as tofu is plant-based. It’s a great vegetarian / vegan protein-substitute! If you’re on a diet, perhaps you can try out tofu. It’s low fat, low carb and high in protein, which is pretty awesome as it means you stay full for longer. Tofu is also lactose-free and gluten-free, something I realised only after being more conscious of food allergies after one of my grand-daughters was diagnosed. I’ve since had to be careful of what I prepared for her, and tofu’s been a great ingredient to cook for her! The quickest easiest tofu recipe ever! 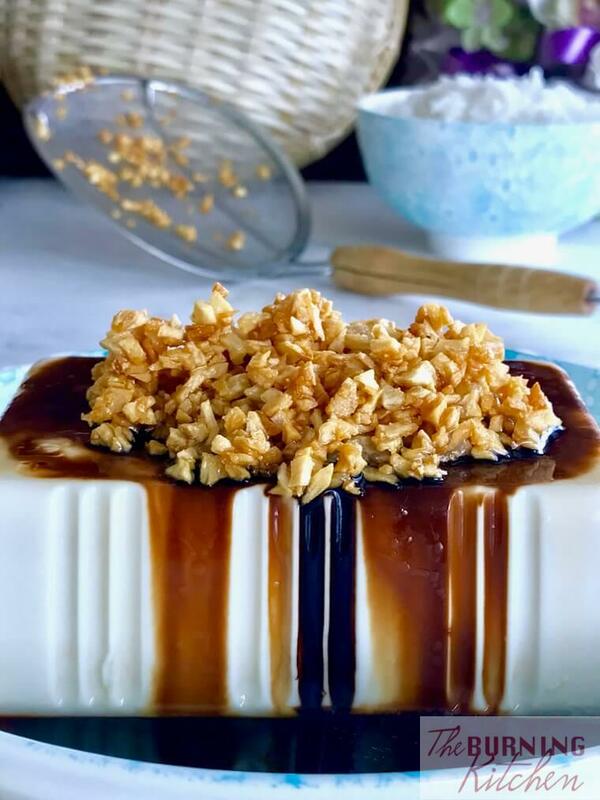 You can actually make your own tofu at home using home-made soy milk by adding a coagulant such as Epsom salt and allowing the mixture to set. But today I won’t be sharing about how to make tofu. Instead, I will share a very simple and healthy cold silken tofu recipe with crispy garlic using store-bought silken tofu. This is one of my favourite under-30 minutes recipes to put together! 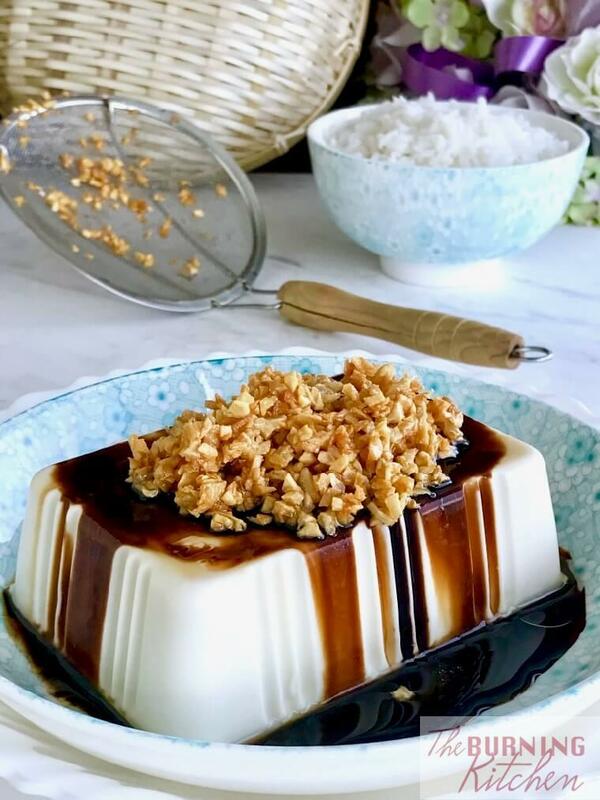 In this tofu recipe, I will focus more on the sauce and crispy garlic topping which enhances the flavour and texture of this soft tofu dish. The method for cooking crispy garlic is similar to crispy shallots, which I covered in a separate post. 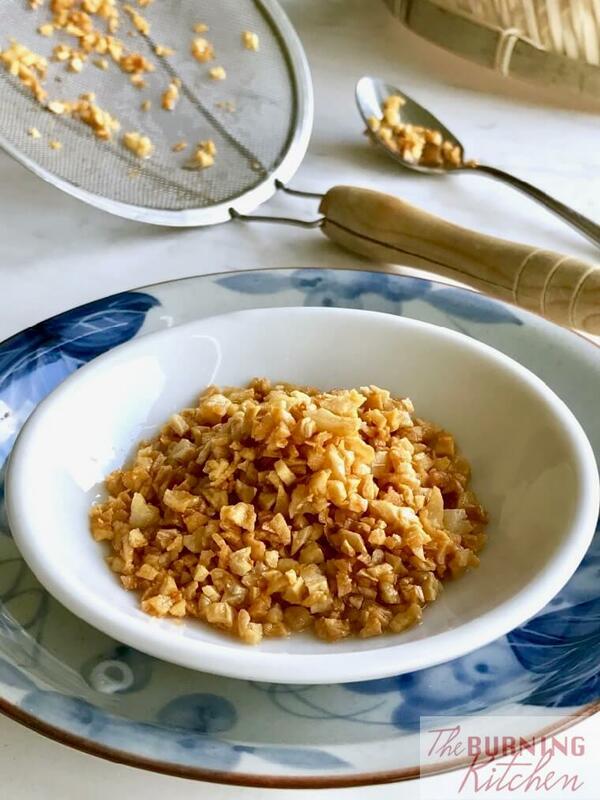 Once you mastered the art of cooking the crispy garlic / crispy shallots to golden perfection, you will be able to add these delicious crunchy toppings to spruce up the flavour and aesthetics of any dish! It’s fast to make! This dish can be made in under 30 minutes. It’s also fuss free and requires few ingredients. It’s a healthy dish to eat. Like I mentioned earlier, tofu has loads of health benefits! So get into healthy eating with this dish. Note: For Special Diets, please read the notes at the bottom for suggested modifications. HOW TO MAKE COLD TOFU WITH CRISPY GARLIC? Remove the skin of the garlic, then wash and pat dry. Next, chop the garlic finely. Wash the spring onions and cut into small pieces. Set aside for later use. Remove the plastic cover from the tofu box. Invert the tofu over your palm. Give the bottom of the plastic box a gentle squeeze to loosen the tofu and it will drop onto your palm. Rinse it quickly under the running tap and transfer the tofu on to a medium sized plate. Then leave it in the fridge for later use. In a wok, heat up 6 TBsp of oil over medium heat. Once done, pour the crispy garlic over a sieve to separate the garlic from the oil. When ready to serve, take the tofu out from the fridge and remove any excess water from the plate. Spoon 2-3 TBsp of the garlic oil over the tofu. Drizzle the dark soya sauce over the tofu, followed by the light sauce and sesame oil. Lastly, place the crispy garlic on top of the tofu and serve chilled. Buy the extra smooth or the Japanese silken tofu. When frying the garlic, watch it closely. Once the garlic starts to turn light golden, turn off the heat immediately. The oil will continue to cook the garlic. If the garlic is still not sufficiently gold, turn the heat back up for a few seconds more to reheat the oil, then turn it off again. If you wait until the garlic turns golden to turn off the fire, the hot oil will continue to cook the garlic until it is brown and has a bitter burnt taste. It only takes a few seconds to burn the garlic, and you will have dump it and prepare another fresh lot. Control the fire carefully to ensure that the garlic is just golden, not brown (ie burnt) is the key to this recipe! Top it up with crispy pork or chicken floss if garlic is not to your liking. Most children would be delighted! It is best eaten chilled. 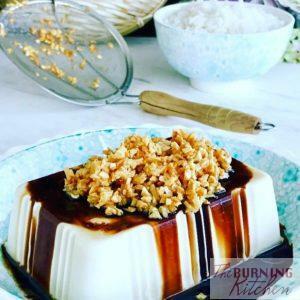 This simple 17-minute cold silken tofu recipe is my favourite recipe when you need to whip up a fast and healthy dish, with the crispy garlic and condiments harmonising with the smooth and creamy texture of the tofu. Try the recipe today! Thank you for the recipe. I just wanted to bring to your attention that women who have breast cancer which is oestrogen linked (hormone dependant) must try to avoid soya products. This is because the main component of soya bean is phytoestrogen. – which is actually the plant version of oestrogen. The ingestion of soya bean products will give good to those cancer cells.